I receive some of NoshOn.It’s newsletters and I love them, so when Vijay offered to guest post here, I gladly took him up on the offer. 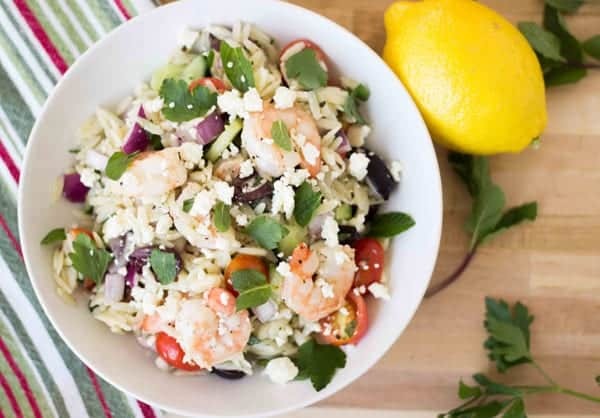 This flavorful Greek orzo salad will satisfy you with the Greek flavors you love including mint, lemon and parsley and it won’t require fat-pants! Hi Rachel Cooks readers! I’m so happy to be here today and thanks to Rachel for inviting me to share one of my recipes. I have to admit, I have an unhealthy obsession with Greek salad. I know it’s nothing special (and to be honest, I’m not really sure how “Greek” it is), but there’s something about the simple combination of lettuce, red onions, olives, tomatoes, and a heaping pile o’ feta that I just can’t resist. But when I was thinking about what recipe I wanted to share with you guys, I came to a realization…I’ve never made Greek salad at home. Cue the shudders. I know, right? It’s kind of silly but for some reason, Greek salad has always been one of those things I’ve left to the restaurants, which is completely irrational since it’s so simple to make. So today, I decided to take all of the flavors of a traditional Greek salad and turn it into something a little different. Admittedly, I wouldn’t typically call myself a “light and healthy” cook, but lately, this is the kind of food I’ve been craving. Growing up in a South Indian household in Texas and living around the world, I’ve been exposed to rich flavors from all different cultures and that’s the way I usually love to cook. Inspired, hearty, and comforting. Our winter meals here in Boston have been filled with plenty of rich, heavy comfort food and I’m about ready for a break! So today, put the slow cooker away and try out this light(er), fresh salad to get you ready for the changing of the seasons. Instead of using lettuce as the base for the Greek orzo salad, I went with orzo, the little rice-shaped grains of pasta that are the perfect vehicle for the rest of the flavors in the dish. I love using orzo instead of rice because it has a pretty neutral flavor and nice chewy texture without any of the stickiness. Plus, it cooks up in less than 10 minutes! 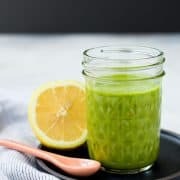 I add a healthy dose of a bright lemony oregano vinaigrette to the orzo while it’s still hot so it soaks up all of the flavors. 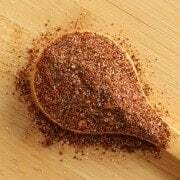 The vinaigrette also serves double-duty as the marinade for the shrimp, which are quickly roasted in a hot oven. Into the cooled orzo go the rest of the traditional Greek salad components – tomatoes, red onion, cucumbers, and feta (oh yes, plenty of feta). I also added a healthy handful of chopped mint and parsley for some extra freshness. Toss it all together and you’ve got a light dinner or delicious side dish. Plus, I’m not the best at estimating portions so this will feed the entire family with plenty to spare for lunch the next day! One of my little secrets is that right before serving, I add an extra squeeze of lemon juice and drizzle of a good olive oil just to help brighten everything up one last time. 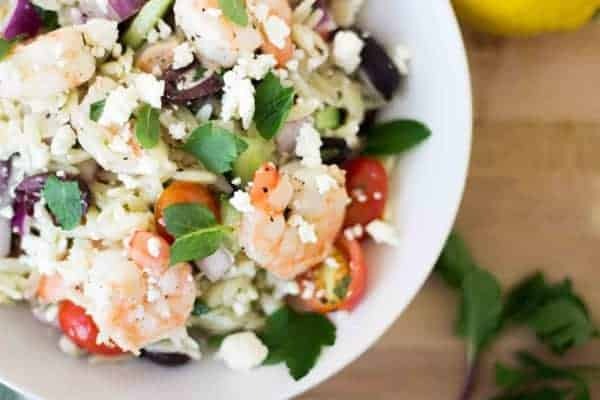 This Greek orzo salad is delicious served at room temperature and even better cold once all of the ingredients have had the chance to meld together. 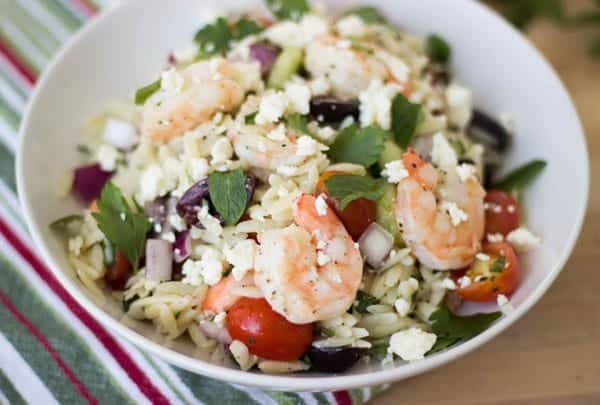 If you’re looking for a way to have a healthy and just-filling-enough dinner that’ll serve you double and triple-duty throughout the week, I hope you’ll give this Greek orzo salad recipe a try. Or, if you’re like me, cure your Greek Salad addiction by (finally) making it yourself at home! The crunchy, salty, fresh, and tangy combination is sure to make you do a happy dance – just. like. this. Thanks again to Rachel for having me and I hope you’ll come say hello to us over on NoshOnIt! 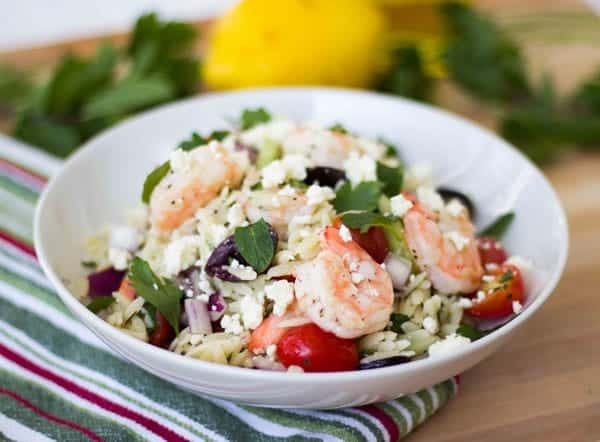 This flavorful salad will satisfy you with the Greek flavors you love including mint, lemon and parsley, tossed with orzo, it won’t require fat-pants! First, make the dressing, which will serve double-duty as marinade for the shrimp. Whisk all of the ingredients together and set aside. In a separate bowl, add 2 tbsp of the dressing to the shrimp and toss to combine. Place in the fridge until ready to cook, no more than 20 minutes. Bring a large pot of heavily salted water to a boil. Add the orzo and cook according to the package instructions. Drain thoroughly, add to a large bowl, and pour over the reserved dressing. Toss to combine and let sit to the side to cool to room temperature. Preheat the oven to 425 degrees F. Remove the shrimp from the marinade and spread on a sheet pan. Roast for 6-7 minutes until the shrimp just turns pink. Remove to a plate and allow to cool. Cut in half into bite-sized pieces. To the cooled orzo, add the cucumber, red onion, cherry tomatoes, olives, feta cheese, parsley, and mint. Toss to combine. Add a few more drizzles of olive oil and a big squeeze of lemon to finish. Actual nutrition may vary depending on how recipe is prepared. Does not include extra drizzle of olive oil. ummm this looks and sounds amazing! I love anything Greek! I love this recipe as I am huge lover of Greek food too. YUM! Thanks so much Bree! Aren’t the flavors in Greek food so good? Love the freshness of it all! Hi Rachel! And Vijay! I love you both! :) I need to make this. Like, yesterday. I simply adore shrimp anything and everything. This looks amazing! So refreshing and perfect for springtime. Thank you Sally – appreciate it =). I think shrimp is one of the most “accessible” forms of seafood so I love cooking with it too! Plus, you can get decent shrimp at almost any grocery store year round so it’s a reliable stand by! Yay, love Vijay! So glad to see him over here :) This salad looks amazing, we’re on a major shrimp kick lately. It’s just so quick and easy! Thanks Tracey – love ya too =). Doing the shrimp in the oven makes it super easy to cook for a crowd! I’m a sucker for orzo salads and this one looks amazing! Pinning and hope to try in the warmer weather months. Even when it’s cold outside, you can trick yourself into thinking it’s summer with this one! I love seafood and I love nosh it! This looks great Vijay! Looks delicious! I love that you added shrimp to these classic Greek flavors! Thank you so much Heather! We don’t eat a ton of seafood at home but I like the sweet/briny flavor of shrimp here. Perfect summer recipe, I cannot wait to be eating something like this on my porch while enjoying the warm weather! Seriously! Even when it’s cold outside, I want this to convince me that spring & summer are on the way. This sounds awesome Vijay! 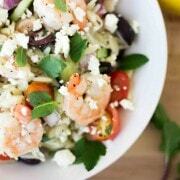 I love shrimp..and feta..and greek salads are one of my favorites!! This is so light and springy! Love this! All of the above here too! 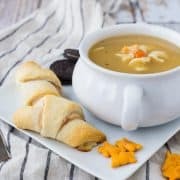 I was in one of those moods where I was ready for winter to be OVER when creating this recipe. Now, it actually looks like that’s coming true! Vijay, and Nosh On It are awesome. Lovely guest post and meal! Thanks so much Carrian! Glad you liked it! Love seeing Vijay guest posting here! This salads looks incredible! Definitely my kind of salad. This is awesome…totally my kind of salad. The shrimp looks perfect! They were perfect Cassie! I like doing them on high heat in the oven so you can get a bunch done at the same time. Vijay this salad looks wicked good… and I don’t even like shrimp all that much! Great guest post. Thank you so much Carrie! You could easily substitute grilled chicken for the shrimp or just leave it out.